Beautiful 2 BR Condo with Breathtaking View of the Lake!!! 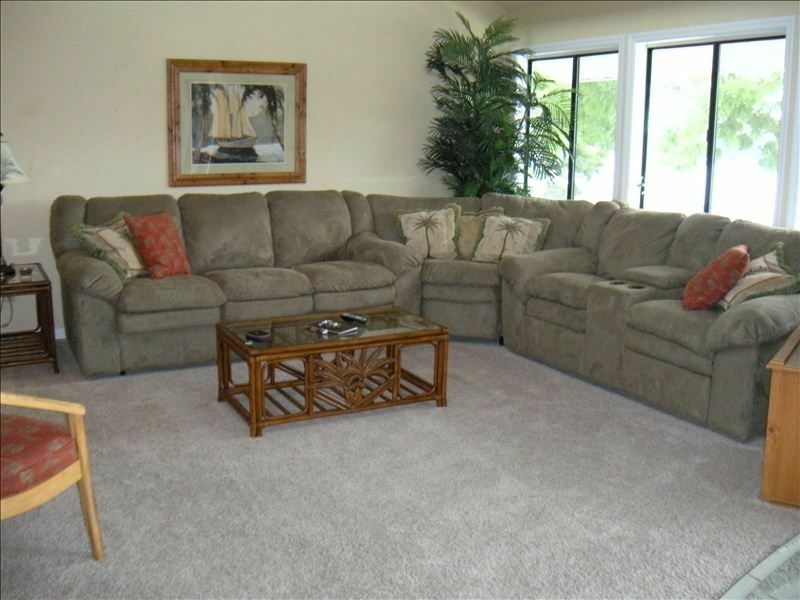 Welcome to our updated and tastefully decorated lakefront condominium at Compass Pointe! Visitors to our two-bedroom, two-bath unit enjoy a terrific view and easy access to the lake, a fully equipped kitchen (utensils and appliances), a washer and dryer for extended stays, and a cozy living room fireplace for cooler evenings. For the boating enthusiast among you, we are located between Mile Markers 18 and 19. Your vacation condo sleeps four guests comfortably in the two bedrooms, and another two guests in the queen-size sofa bed. The master bedroom has a comfortable queen-size bed and private full bath (shower only). The second bedroom also has a queen-size bed, and connects to the hall bathroom which has a double bowl vanity and separate bath (tub with shower). Linens and towels are provided for your use. Compass Pointe Condominiums is centrally located in Osage Beach, within walking distance of the outlet mall, and close to many other amenities like golf, shopping, and dining, from casual to fine. There are many water-oriented activities available as well, from boating and fishing to parasailing and jet skiing. Special Note: Must be at least 25 years old for rental. Since we are on the top (4th) floor of the building, we have a great view of the main channel of Lake of the Ozarks. The parking lot is level with the 3rd floor, so accessing the condo is a breeze! This condo is situated on the tier closest to the lake, with a walk down several flights of stairs to get to the dock area. Easy access from the parking lot, walk across a walkway to the 3rd floor landing, go up 2 short flights (7 steps each) the condo! The condo was beautiful. Everything was clean and comfortable. It was perfect for our girl’s weekend! We would definitely stay there again. This is the perfect spot for a weekend getaway! Close to all the popular attractions. The condo is beautiful and John and Pam are great to work with! Will definitely book with them again. This condo is great! It has everything you need to have a great time at the Lake! Very spacious condo with comfortable beds, nice kitchen with all the dishes, pots and pans, and kitchen utensils you need, and a beautiful view of the lake from the balcony. It has cards and games to play. It has a washer and dryer. Overall, we couldn’t ask for a better place to stay. We will definitely rent this condo again. This was my 4th time at this same condo. My girlfriends and I used to stay here for our annual Girls Weekend, but this year I decided to bring my 2 daughters. Great location & great views. The condo was very clean and well stocked. John & Pam we’re very quick to respond to any questions I had. Looking forward to coming back next year.